Use this search tool (powered by Google) to check our site for the chemistry information you need. The search will only look at the Rader network of science and math sites. Thanks for visiting! Right now you're on BIOLOGY4KIDS.COM. It's not just biology for kids, it's for everyone. If you are looking for basic biology help and information, stay on this site. We have information on cell structure, cell function, scientific studies, plants, vertebrates, invertebrates, and other life science topics. If you're not sure what to click, try our site map that lists all of the topics on the site. If you get lost in all of the information, use the search function at the top or bottom of each page. What is biology? Well... Here's our best definition: Biology is the study of life and the changes that take place with and around all living things. The study of life extends far beyond Earth. Biology covers every planet and object in the Universe. In the same way that everything on Earth is made of atoms, everything that is alive on Earth is made of cells. An entire living thing can be one cell or it can be billions. Most cells on Earth have similar pieces and parts. Let's get started and look inside cell structure. Go take a look! That's it for the introduction. Now it’s up to you to click and have fun! 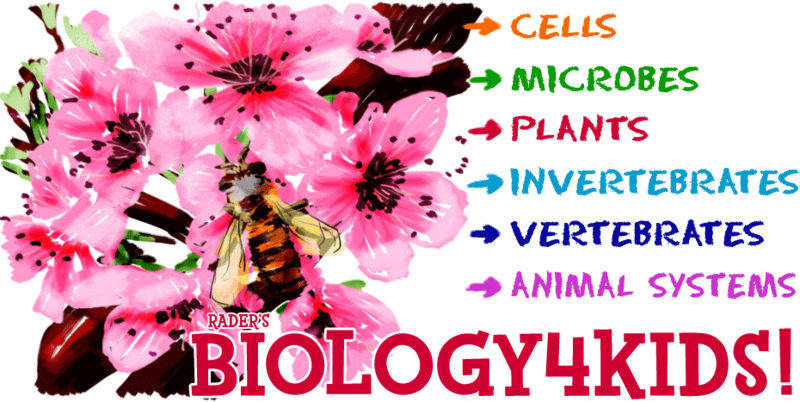 BIOLOGY4KIDS is one of many free science sites developed by our team. You may have also used Chem4Kids, Geography4Kids, Cosmos4Kids, or Physics4Kids. We even have a math site called NumberNut.com. If you're not into graphics like home page image above, use the search tool (powered by Google) that will check our sites for the biology information you need. Type in a keyword or phrase and click the search button to get started. ** Andrew Rader Studios does not monitor or review the content available at external web sites. They are paid advertisements and neither partners nor recommended web sites. Also, we do not collect or ask for personally identifiable information on any of our sites.